When I saw this cute little spring centerpiece, I just had to smile and share! 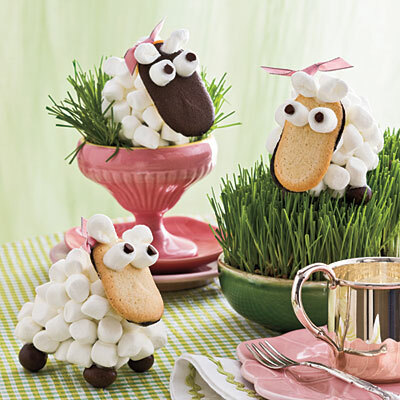 You can find the instructions for making the little marshmallow and Milano cookie lambs here. I like the grass, too! So I would need 4 bags of Milanos to account for what I'd eat during assembly? And 3 bags of marshmallows for what the kids would hoover? Absolutely adorable! That's adorable, and those little lambs look delish. These are really cute. Who wouldn't smile at these? Those little sheep would get eaten in no time! But they are cute! Oh My Goodness!! I had the biggest smile when I went to your post here. Simply adorable. I might have to try this recipe for the boys and Taj. What a cute idea...my problem would be in eating the Milano's before I could finish the little sheep!